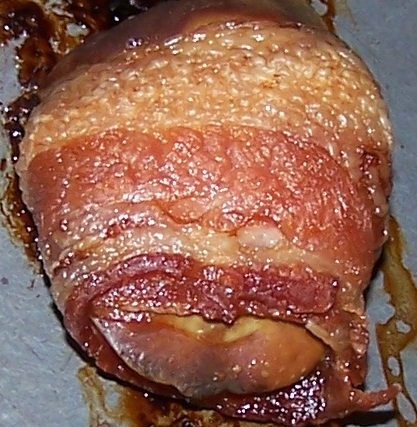 For this Hub, I will show my roasted chicken dinner along with all the trappings which included using the liver (wrapped in bacon), to make Rumaki . 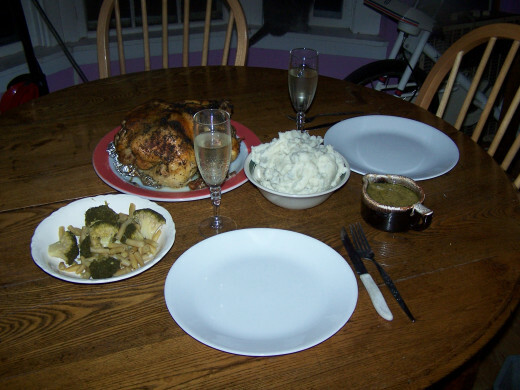 I had wax beans, mashed potatoes, broccoli, of course stuffing, gravy, and, for a beverage, we had a bottle of Champagne. In this hub I will show my preparation of this dinner and describe some of the utensils and things that I used also. 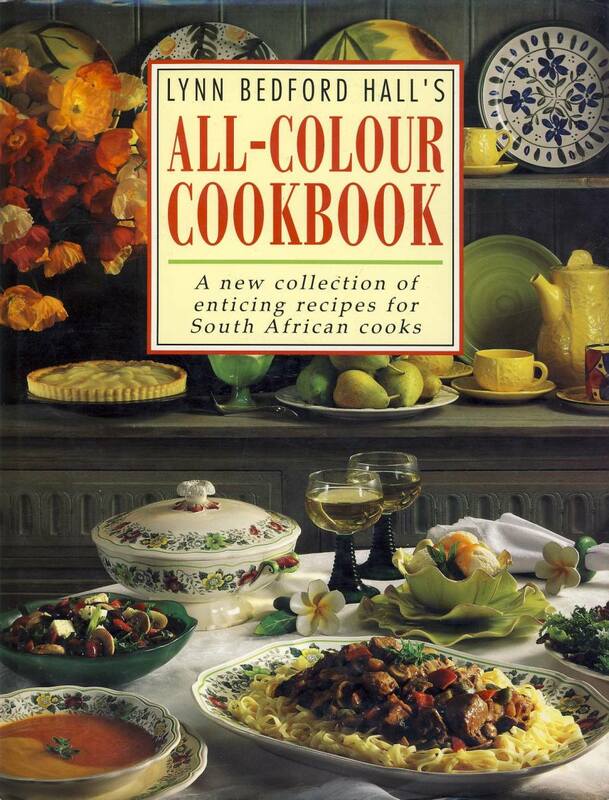 Yields: Serves 4 people generous portions. Make broth from giblets and neck. First, I remove the chicken from its packaging in the sink because there is usually some liquid in any packaged chicken. I am careful to make sure that I use soap and water to clean any surfaces that the raw chicken has come into contact with to prevent salmonella. I take the time to wash my hands very well with soap and water. I remove the giblets that were tucked inside the chicken, (neck etc.) 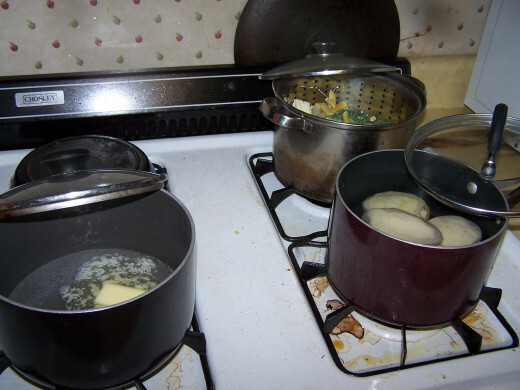 and place these items in a separate pot of water so that I can boil them to make broth. Later I will add this broth to the drippings to make gravy. I make sure to thoroughly clean the inside and outside of the roaster chicken with tap water. 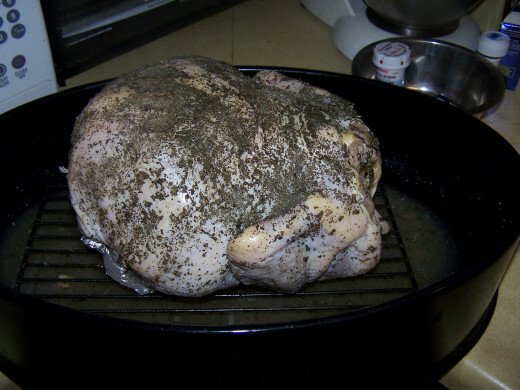 After I have loosened the skin of the chicken [careful not to tear the skin], I rub butter and sage underneath the skin. Then I rub butter and sage all over the outside of the chicken skin. I usually do this entire process in the sink to make clean up easier. This is the time to preheat your oven to 350F degrees. As I'm not supposed to use much salt for flavoring, I have been growing my own herbs as a substitute. I also have a friend that had grown this large sage plant and she allowed me to harvest whatever she didn't want. So I used a food drier and dried all this sage and then ground it in a processor. I store it in a glass jar for use whenever I want like now with this chicken. After I have rubbed the whole chicken with sage and butter, I cover the wings and the drumsticks with tin foil to keep the skin from burning. Then I calculate how long it will take the chicken to roast. Usually the chicken packaging will tell you how many hours per pound it will take to roast your chicken. If not, please look it up in a recipe book (for sure, the weight will be on the packaging). 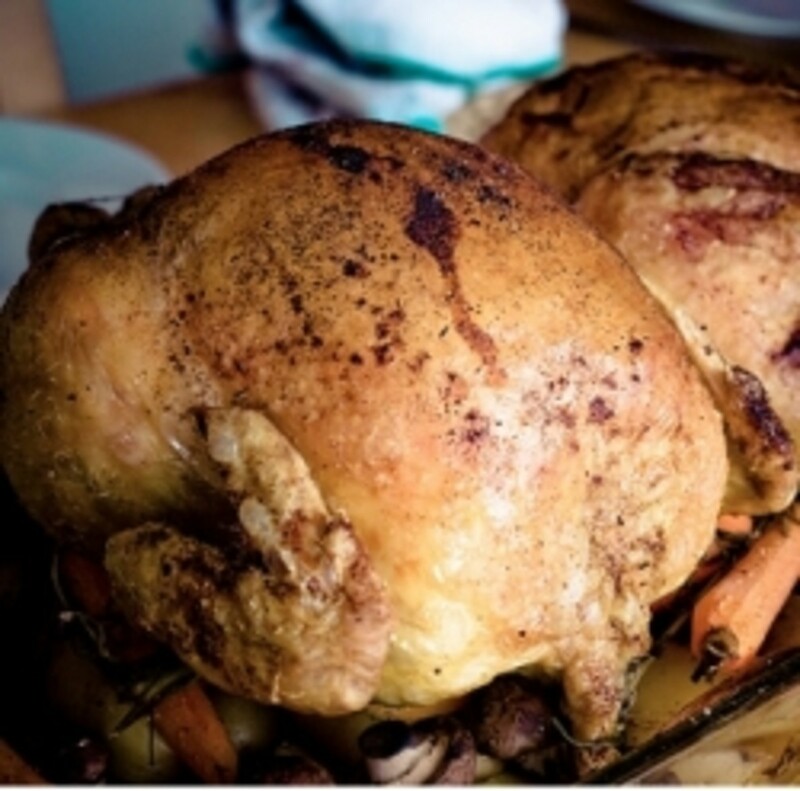 I have found that the usual roasting time for chicken is 25 to 30 minutes per pound at 350F. 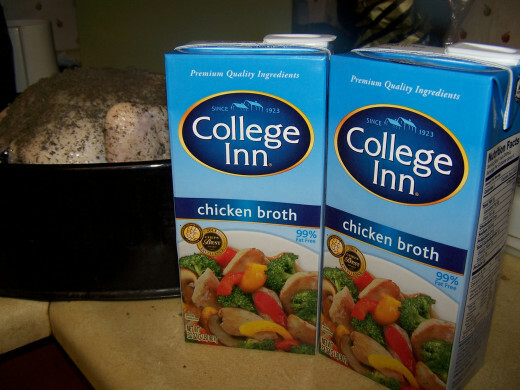 Now that I am preheating the oven, I add a couple of boxes of chicken broth to the roasting pan to help keep the chicken moist. 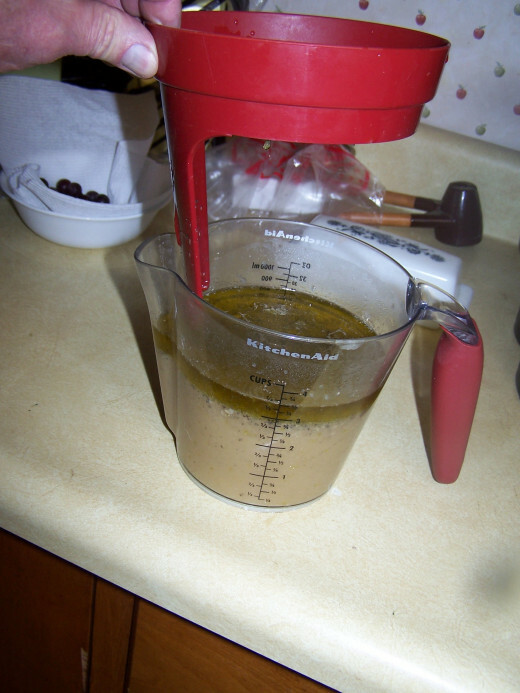 In addition, this provides extra liquid and flavor to blend with the drippings you will use to make gravy. 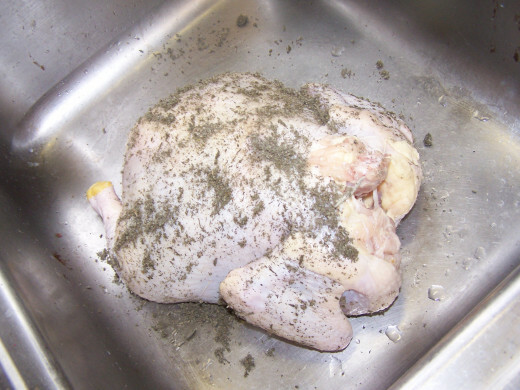 Cover the roasting plan and place the prepared chicken in your oven. 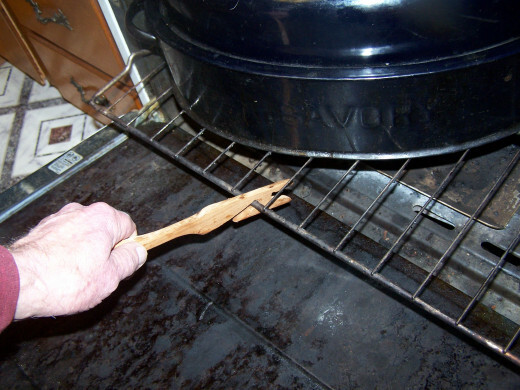 Be cautious to not get burned from the hot interior surfaces of the oven. 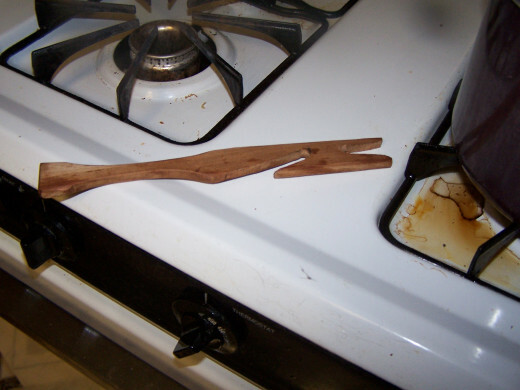 This is a handmade tool designed for pushing and pulling hot oven racks to avoid burns..
As the chicken roasts, I utilize the spare time to prepare the remaining dishes that I plan to serve. Here I'm peeling the potatoes. 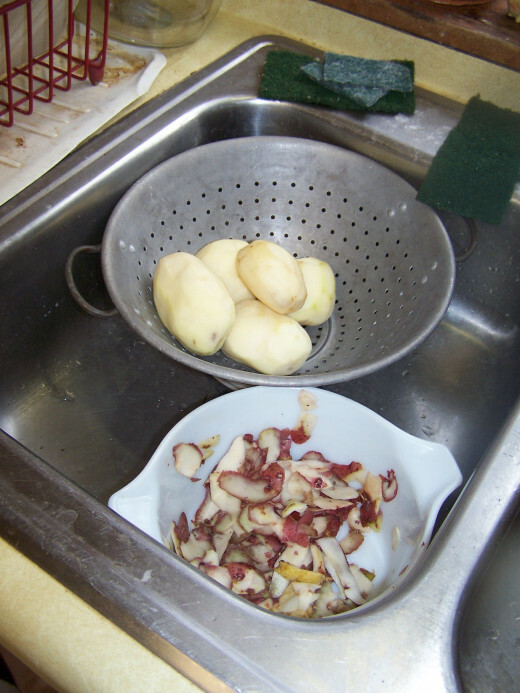 Place the potatoes in a pot of water (I cut the potatoes into smaller pieces as this allows them to cook faster). Here I show the potatoes beginning to boil. I usually cover them. 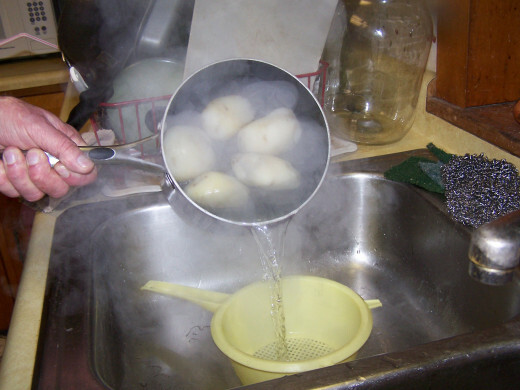 This prevents steam from evaporating and making the potatoes cook slower. Also I can use less heat and still maintain the boil. As the potatoes are boiling, I start preparing the vegetables that I have decided to serve. 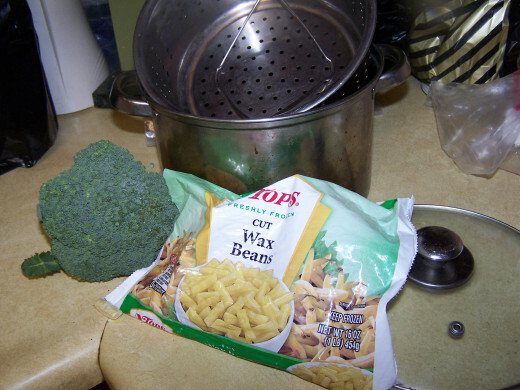 For this meal I chose wax beans along with broccoli. My parents used to boil their vegetables, but my wife and I know that this takes away some of their nutritional value, so we use a vegetable steamer. This steamer has a perforated inner removable container surrounded on the outside with a solid container. After adding my vegetables, I run some water in then cover and heat. 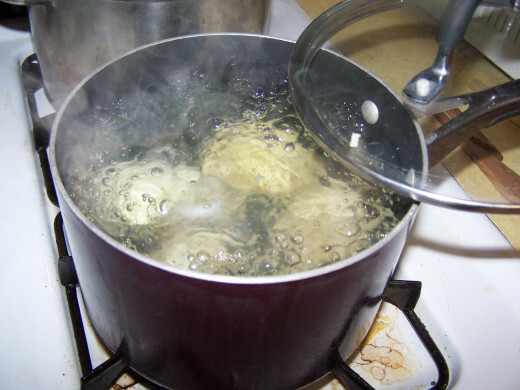 As you drain the water from your boiling potatoes, use caution that you do not get burned from the steam that comes from the boiling hot water. Everything in their pots cooking. As the chicken is roasting, I use a smaller baking pan and bake the runaki also. 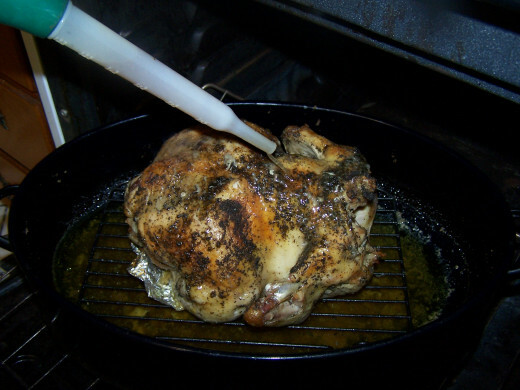 As the chicken is roasting, I baste it using its own juices to brown it but also to keep the meat moist. If you are a first time user of sage, the appearance may be new to you but believe me the dark green color is worth the immense flavor. While the chicken roasts, another step I take is to prepare my mashed potatoes. They were peeled before boiling, and now I run them in my wife's countertop mixer. As the potatoes are mashing. I add slices of butter, a pinch of salt, and a pinch of pepper. I add milk slowly to make them creamy. 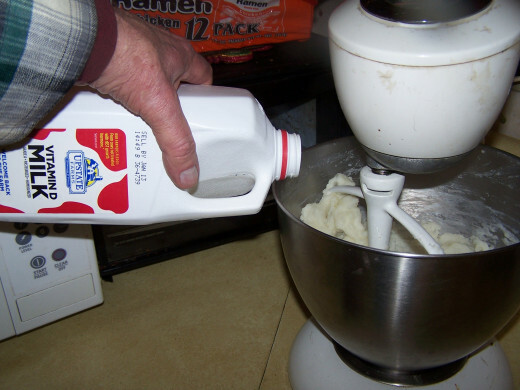 The more milk you add, the creamier and light your mashed potatoes will be. I called this my wife's mixer because my wife's son and I purchased the mixer as a present for her. However, now that I have begun doing most of the cooking, I guess its sort of mine. In this photo I'm showing how this wooden tool works. I like using it. As the chicken rests, I prepare the corn starch to thicken the gravy. I mix about equal parts of corn starchy and water. To start I would do three Tablespoons each. But if the gravy doesn't thicken make another half and half mixture to add to the drippings and broth. 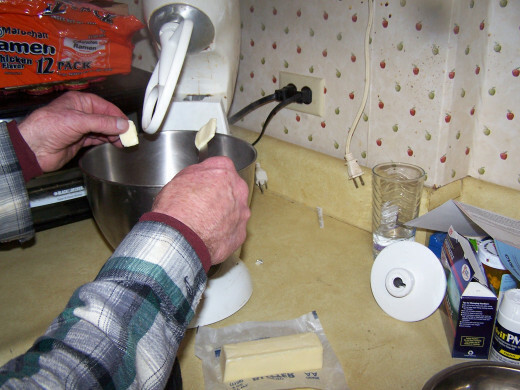 In this process, it is important to use a whisk to keep lumps from forming. You want the drippings/broth/gravy to be close to boiling but not quite. Later on I worry about the gease. I have a special separator that allows for the removal of the excess grease you will see its picture below. 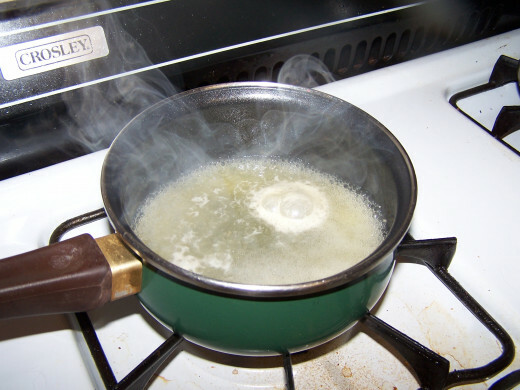 After preparing the corn starch to thicken the gravy, add to the drippings using a whisk. 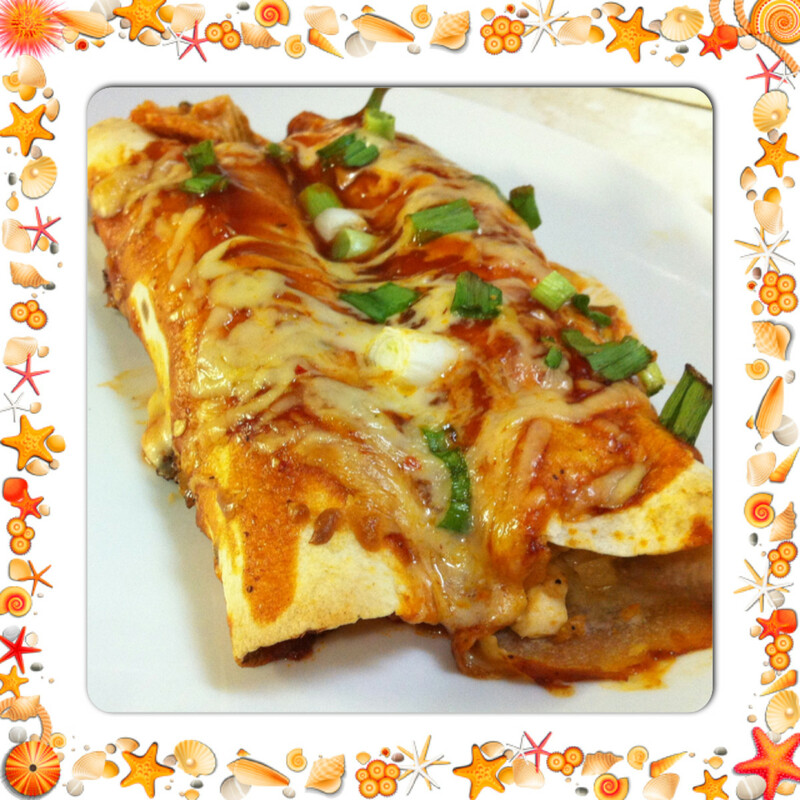 Be cautious to not allow the mixture to boil as you add the corn starch, or it will nullify the effect. I have a special separator that allows for the removal of the excess grease shown below. 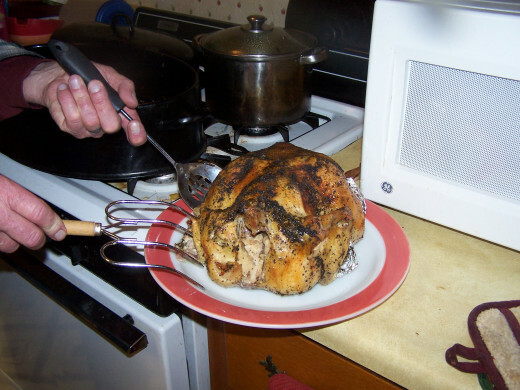 When you first take a roast or a whole chicken/poultry out of the oven you let it set on the stove top before carving. These few minutes of "resting" allow the juices to seal in the piece. As the chicken is resting I utilize my time to make the gravy. 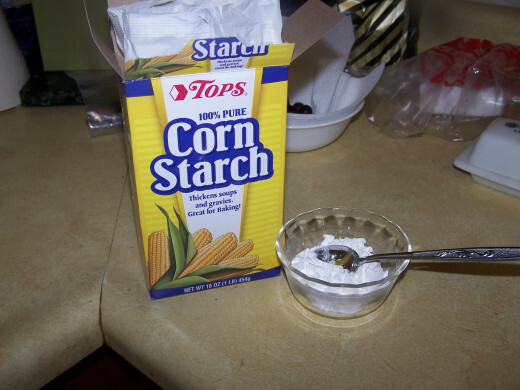 I use corn starch to thicken the gravy. I prefer a super thick gravy so that it stays on the chicken, potatoes, and stuffing. My wife grew up with a thinner gray, so it is a matter of taste. 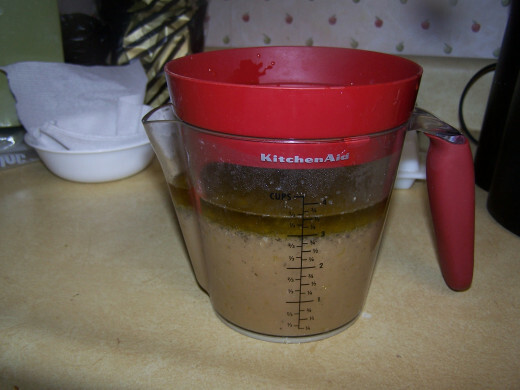 I have a device that separates the excess fat from the drippings to allow you to serve a better gravy. After you pour the drippings into it, then wait for a few minutes for the fat to rise to the top and when it does, you slowly pour it out and the best drippings remain. This separator tool has a tongue that goes down nearly to the bottom so that when you pour the excess fat off the best drippings remain. Once this has been accomplished add your remaining grease free material to the roasting pan [that I roasted the chicken in], along with the corn starch mixture (I find that mixing the corn starch with cold water works best). Now stir with the whisk. Waiting for the gravy, I begin draining the vegetables and placing them in my serving bowls. along with a spoon for serving. Now that the chicken has rested, I remove the stuffing, placing it in a bowl ready to serve. Again placing a serving spoon along with it. We finally got to sit and enjoy this wonderful roasted chicken dinner. 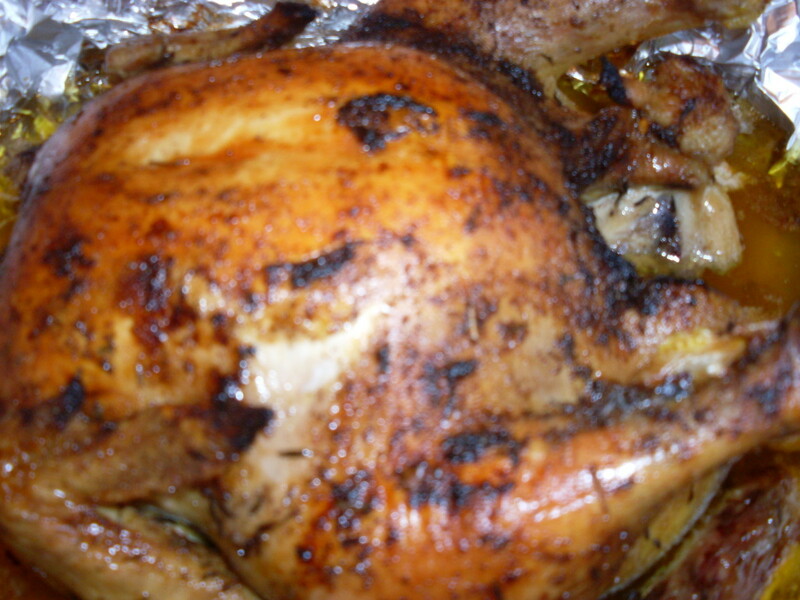 This roasted chicken was so moist and tender that it almost literally melted in your mouth. 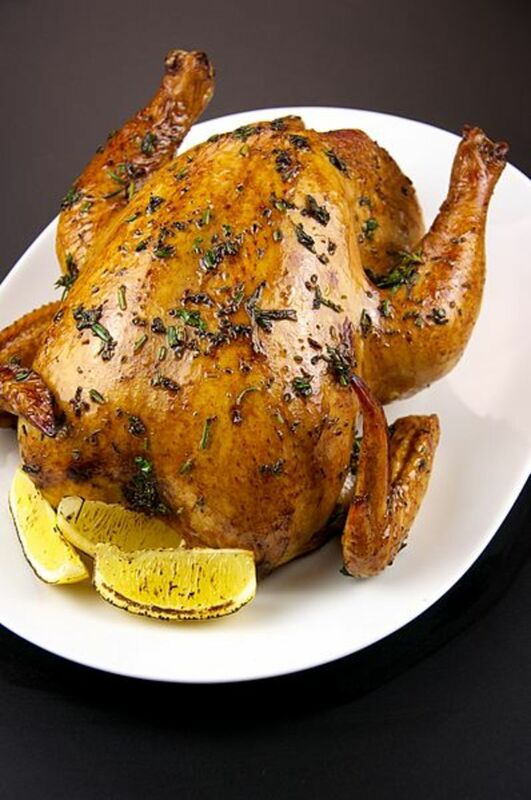 Is my hub for Roasted Chicken Dinner easy to follow? I found this hub to be informative and helpful. I will plan on following you on hub pages. 41 Tips And Common Sense Techniques To Make Cooking Easier In This Hectic World! !